Name a really epic third part of a trilogy, one that’s the defining part of its trio of movies. It’s harder than you think. Apparently Lord of the Rings is as good as it gets for a part three, but I’ll have to take the internet’s word for that and present Back to the Future III for the prosecution’s case. So let’s consider this, the climax of our own three-part series on the Mercedes-Benz A-Class, before AMG gets involved and takes over with the excellent A35. To recap, we started life with the entry-level A180d diesel model in mid-range Sport trim before switching to the A200 petrol model in the plusher AMG Line specification. And now we’re in the A250, again in AMG Line but with three key differences we’ll examine. First, the A250’s turbocharged 2.0-litre petrol engine, which, in this state of tune, produces 221bhp and 258lb ft. The A200 has a 1.3-litre with 161bhp and 184lb ft, so that’s quite a jump in capacity. There’s also an A220 that splits this pair, which gets a 187bhp version of the 2.0-litre, for the sake of completion. Second, we welcome the interior’s show-stopper for the first time: the twin 10.25in screens for the MBUX infotainment system. This dominates your eyeline in the cabin with its rich graphics, mixing infotainment in the centre of the dashboard with driving information on the right screen, which replaces an instrument binnacle. We’ve gone from two smaller screens in the A180d, to one large and one small in the A200, but now we have the full ‘do you want to go large?’ option. Lovely it is, too, both visually and in its functionality. But worth the extra £2000-plus cost over the lesser systems? Let’s see. Third, that £2000-plus cost (£2200 to be precise) isn’t just for the larger instrument screen but is the price of the Premium Plus package (£3595) over the Executive package (£1395). So you get plenty of bells to go with its whistle, including some fancy ambient interior lighting, a better sound system, adaptive LED headlights, memory heated seats and a panoramic sunroof, which arrives just in time for the spring. That’s some 15% of the car’s list price on one option alone, so assessing its value will be intriguing. I was amazed at the A200’s easy-going economy, with 50mpg frequently popping up on the trip odometer on my 30-mile-each-way mixed-road commute, I enjoyed the extra agility and fleet of foot the lighter engine brought to the handling over the A180d and was pleased to report the body control improved somewhat with the adoption of a multi-link rear axle, even if the low-speed ride issues weren’t completely solved. I will miss it, although there’s now a sense of excitement to try the kind of car you don’t see enough of these days: the cooking petrol. Most buyers switched to higher-powered diesels instead of the likes of the A250 in the past decade to get a good slug of the performance mixed with more favourable economy and taxation, but given diesels are apparently all evil these days (don’t get me started…), petrol power is making a comeback. It’s early days, but I’m enjoying the greater muscularity of the 2.0-litre engine in the mid-high rev range, as well as a useful improvement in the-gap-in-the- traffic-exploiting 0-30mph performance that’s so useful in the real world. And none of this is at the expense of economy too much, with the car returning 40-42mpg on my commute. 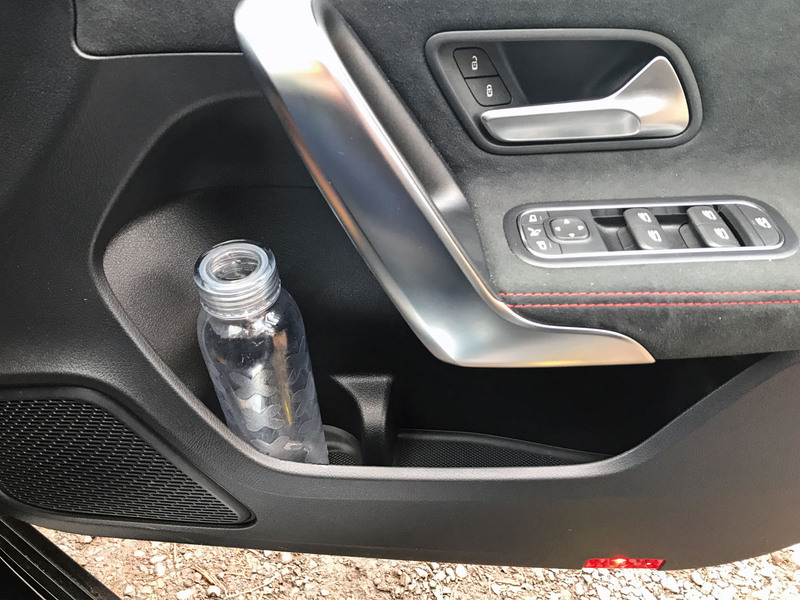 The seven-speed automatic gearbox’s application in the A250 has been the most impressive yet. You’ll remember it has been one of the few black marks against the A-Class elsewhere. While still not completely cured of that low-speed hesitancy, you can trust the ’box to listen to your right foot in a more acceptable timeframe. Bodes well for helping see the car at its very best in its remaining time here. AMG-like looks This has plenty in common with the A35 AMG at first glance, which is a good thing for kudos. Active lane keeping assist Still grates. Now gets confused by old painted-over lines from roadworks and tugs the wheel. The quality and design of this A-Class is class leading and it hasn’t been done at the cost of usability. Front door bins are deep and cavernous. No handbrake or gearlever means the centre tunnel is also handed over for more storage. The glovebox is a decent size. Rear passengers get nets on the front seat backs and door bins of their own. Impressive. Some option packs are better value than others. The A-Class’s £1395 Executive Package certainly works. It includes heated seats (essential in winter), the excellent 10.25in larger central infotainment screen, front and rear parking sensors, electrically folding mirrors (those last two are vital in our HQ’s tight multi-storey), and the ability to park itself, which I’ve yet to try. Now we’re onto our second Mercedes-Benz A-Class – this A200 AMG Line following the original A180d Sport – the different ways in which an A-Class can be specced to create cars with such different characters are really starting to manifest themselves. Each difference between the two A-Classes is big enough on its own, but combined they create a car that feels like something new again. The most obvious distinction between this A200 and its A180d predecessor is, of course, the engine – and the fuel station pump at which you fill it. The A200 uses a turbocharged 1.3-litre petrol unit to the A180d’s 1.5-litre diesel. The 161bhp/184lb ft engine, co-developed with Renault-Nissan, feels of far greater displacement than its official 1332cc figure suggests, offering plenty of torque at low revs and surprising muscularity at higher revs. You can’t say that about too many downsized turbo petrol units, although it does share its zingy soundtrack when under loads with its small-engined cousins. Impressive everyday economy was a strong suit of the A180d and surprisingly – given that downsized turbo petrols are typically among the worst performers in the real world – you can easily get upwards of 40mpg in the A200, and even push 50mpg if you drive parsimoniously. That’s within spitting distance of the official claimed figure of 53.3mpg. Bravo, Mercedes. One piece of the driveline the two cars do share is their seven-speed dual-clutch automatic transmission. Its performance at step-off and low revs was the worst part of the A180d. The transmission is better in the A200, but not perfect. More work is needed to better integrate it with the engine, and ensure faster and more responsive getaways to get you through gaps in the traffic and roundabouts. The chassis is the other big mechanical change. As discussed previously, the A180d uses a torsion beam set-up for the rear suspension, while the A200 AMG Line gains a multi-link rear axle (non-AMG Line A200s get the torsion beam). Jumping into the A200 for the first time, it felt much more alive in the way it went down the road and engaged the driver. I was surprised at just how much more agile it felt, but put this down to the lighter petrol engine over the front axle helping the handling feel more nimble more than the rear suspension offering greater body control. Comparing the ride between the two cars is a more subjective thing, as it’s not as simple as torsion beam versus multi-link. The A200 comes with the larger 18in AMG alloy wheels, as opposed to the 17in rims of the A180d, and associated lower-profile tyres (225/45 in the A200 plays 205/55 in the A180d). The A200 does feel a touch firmer than the A180d, but the ride is more sophisticated, less ploddy and with better body control. We’re going to keep experimenting with different wheel and suspension set-ups to see if a sweet spot can be found, but it’s advantage A200 AMG Line in the chassis stakes so far. The interior is also a step up in class and sophistication from the already impressive A180d Sport. You’d expect that in a pricier, range-topping trim, but the AMG Line does deliver. The sports seats grip you well and are pleasing to the look and touch, while the optional £1395 Executive Package provides a further boost in perceived quality. Among its additions is a larger 10.25in screen for the central display, the highlight of which is the crispness and clarity of the graphics. A map has never looked so good. I’d grown rather fond of the A180d. As an entry-level ‘real-world’ model (ie the best value you can get for both spec and running costs), it felt like the kind of car to do 20,000 fuss-free motorway miles in each year. The A200 shows just how differently the A-Class can be flavoured, with no less pleasing results. Sleek styling This A-Class isn’t pretty from every angle, but it’s never looked better than in black with AMG Line trim. Transmission response Step-off is better in the A200 than the A180d, but still not as smooth as it should be. The A180d we started this test with has been replaced by the A200 you see here. The A200’s 161bhp 1.3-litre turbo petrol, on first impressions, revs nicely and helps improve the overall drivability compared with the A180d’s 1.5-litre diesel. AMG Line brings a leap in toys and perceived quality over the A180d’s Sport and the more sophisticated suspension subtly improves agility. By the time you read this, A-Class number one of three in this series of back-to-back tests will have returned to its maker. This A180d is to be replaced by a petrol-powered A200, meaning the diesel leg of this trilogy is over and the first set of conclusions can be drawn. What’s worth noting straight from the off is just how relevant a diesel engine of any type remains if you do big miles. When you’re doing just shy of 2000 miles a month, as we were averaging in our short stint in the car, diesel makes the best sense of all. Our average economy figure has slipped from the 60mpg around which it had hovered in the early days. The weather has cooled and the number of shorter journeys has increased, but we’re still mightily impressed by a 55mpg average. That will make for interesting comparison number one as we switch from our 1.5-litre four-cylinder diesel to a downsized 1.3-litre turbocharged petrol in the A200. Just what will our wallets make of the switch? From previous experience, downsized petrols are some of the least impressive for real-world economy. We’ll have the calculator out over the next couple of months and let you know. One thing I won’t miss about this A-Class is the transmission. The seven-speed dual-clutch automatic gearbox’s step-off is the single worst thing about the car. There is simply no go when you ask for it with your right foot, no matter how gentle or hard you are on the pedal. It takes a good second for drive to appear, which is as unimpressive as it is baffling: just how did Mercedes sign off the car like this? It’s a shame, because for the most part the transmission makes for an easy-going counterpart to the A180d once you’re on the move. It kicks down with minimal fuss when required and offers impressive drivability in the 30-50mph acceleration bursts that are a part of everyday driving. The seven-speed dual clutch auto also appears in the A200, so it will be intriguing to see whether the issue is one related to the transmission itself or one caused by its integration with the diesel engine. The next big difference between this A180d and the incoming A200 is the rear suspension. Both the A180d and A200 use the torsion beam rear suspension option – unless you spec your A200 in AMG Line trim, which our car will include to add an extra element to this story. On the standard suspension set-up and with 17in alloys in this mid-range Sport trim, the A180d rides well but not with class-leading status. There is greater sophistication in the way a Volkswagen Golf or Ford Focus rides. The A180d’s body control comes unstuck over higher frequency surfaces and can set the cabin shaking. Intriguingly, there were a couple of big dissenters among the Autocar staff on the way the A180d rides on this standard set-up. The final big change we’ll be noticing is with the MBUX infotainment system. Our A180d has the dual 7in screens, one centrally for the infotainment and another for the driver’s instruments. Others who have experienced the larger 10.25in options in other A-Classes have smirked at how small it is, yet I’ve never had an issue with the graphics, legibility, size or functionality. I’m looking forward to seeing if bigger does mean better when we upgrade one of the two screens on the A200. SEAT COMFORT Not one fidget, tweak of the back or numbing of a bum cheek on even a 400-mile journey. ACTIVE LANE KEEP ASSIST If you don’t want it on, you have to turn it off every single time you restart the ignition. Having spent much of the past year in a Golf, I thought it’d take more than a month or two to familiarise myself with the A-Class. Wrong. Last week I jumped back into a Golf and was surprised by how dated the VW felt. The A-Class has greater material richness and its technology and slickness surpass the VW’s – a car that’s likely on the podium for its class alongside the Audi A3. When did mainstream cars become so expensive? Was it about the same time that the premium players came down to more mainstream segments such as the family hatchback class to try and steal the established players’ lunch? 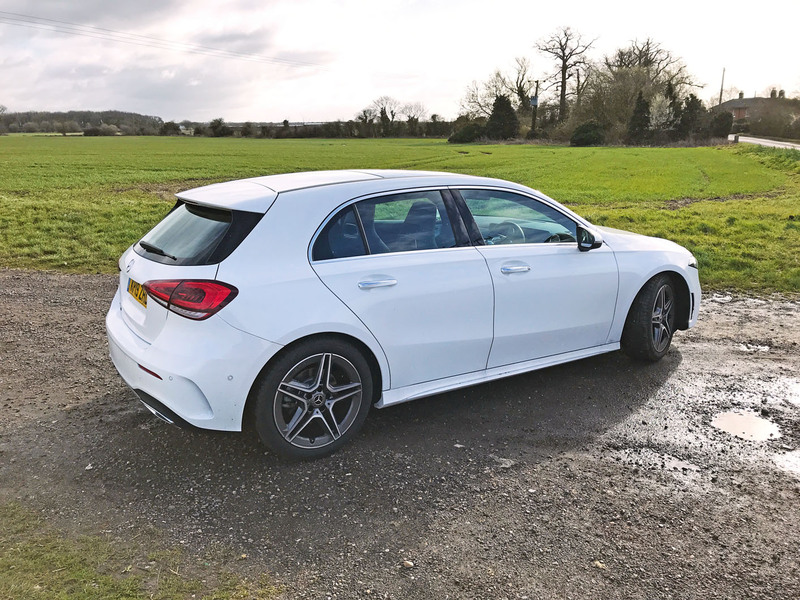 After a month or so quickly piling on the miles in our recently acquired Mercedes-Benz A-Class and getting to know it rather well for the months of this test that lie ahead, I thought it best not to let the chance slip by and do similar with the Ford Focus. After all, it’s the likes of Focus buyers who have fallen under the spell of that Mercedes badge and saved a few extra pennies. The Focus and our A-Class share very similar mechanical specifications. Both use small-capacity four-cylinder diesel engines (1.5 for the Focus, 1.3 for the A-Class) closely matched on power, torque and 0-62mph time (118bhp, 192lb ft and 10.2sec in the Ford plays 114bhp, 221lb ft and 10.5sec in the Merc). Both use automatic gearboxes (an eight-speed torque convertor for the Ford, seven-speed dual-clutch auto for the Merc). They also both have MacPherson strut front and torsion beam rear suspension. And the cost? There’s less than £1000 in it, in the sporty ST-Line X trim in the Focus, and the sporty, erm, Sport trim of the A-Class. By the time you fiddle with the various standard kits and options, you end up with quite literally just a few extra pennies for the Mercedes. Translate that to a PCP deal and a monthly payment, and diddly-squat becomes the numerical value. The point? For however brilliant the Focus is to drive, and it is that, the quality of Mercedes and its overall package are of huge appeal, and the best example of how the premium players are squeezing the middle-market mainstream brands with cars such as the A-Class. Ask the average car buyer whether they’d have a Ford or a Mercedes for the same money, and we can all guess the answer. It’s working for Mercedes, too. The A-Class is perhaps the most commonly spotted new car I’ve seen on the roads this autumn, after the ubiquitous Ford Fiesta. Hardly surprising, when it was the third bestselling new car in the UK in September. Third bestselling? Crikey. Like me, all those owners will be discovering more about what an interesting car it is to live with. The Mercedes’ interior and technology are in a different league from anything else the segment has seen. 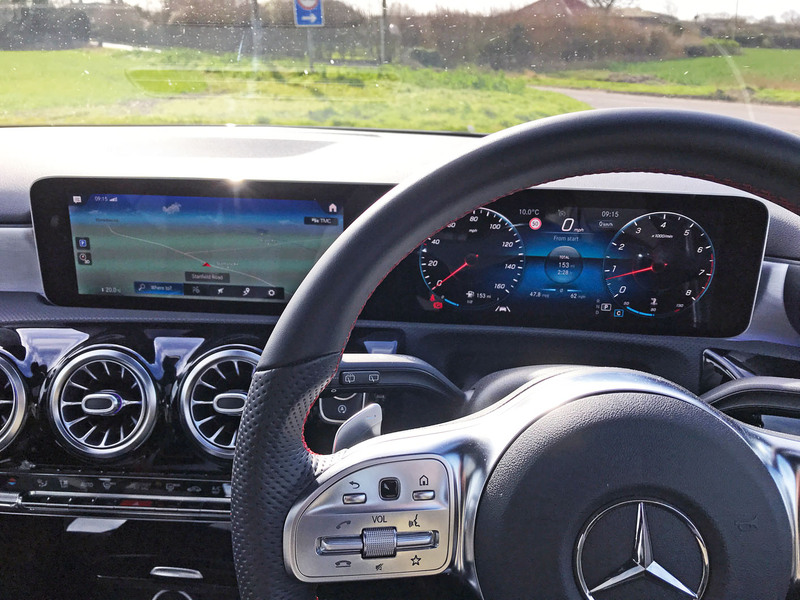 The MBUX infotainment system may be ‘only’ the entry-level one with the two 7.0in screens rather than the full S-Class-style widescreen treatment across the whole dashboard, but it’s wanting for nothing in functionality. I’m continuing to be bowled over by the effortless efficiency of the A180d. The economy has settled around 60mpg now the weather has got colder, a quite extraordinary figure and in another league again to the 45mpg or so average I got from a similar drivetrain in the Focus. That’s another part of the financial argument in the Merc’s favour. Yet there’s a negative point on the transmission, specifically at step-off. It’s just so darn slow to react. Take this example. There’s a T-junction on my commute on the edge of town. You have to pull across the traffic to join a lane that has just come around a blind corner. Gaps in the traffic can be only a second or two, so once you add in your reaction time and the time for the transmission to engage and then to pull away, the gap could well have gone. Manual gearboxes are coming soon to the A-Class and I suspect its overall quality will only increase more when that day comes. Quality feel Classiness and quality run through the A-Class. Solid door thuds are as pleasing as the crispness of the interior screen graphics. Ride quality ‘Loathe’ is strong, but the ride is proving divisive. It’s too firm for some, lacking sophistication for others. I’d call it okay. So the cheaper torsion beam suspension will be a bigger issue for rear seat comfort. I hope you test the car with passengers aboard to test this fully. Mercedes are currently advertising these as available from £269 per month with a £4700 or so deposit, plus you will not own the car at the end of the term. What a collossal waste of money. I'll sort you one for £250PM 47M + 1x£1500, inc VAT, 10k per year, plus my fee of £240. How's that sound? Or perhaps the Merc isn't for you. Interesting to see it without the massive screens. Is it just me, or is there no rev counter?